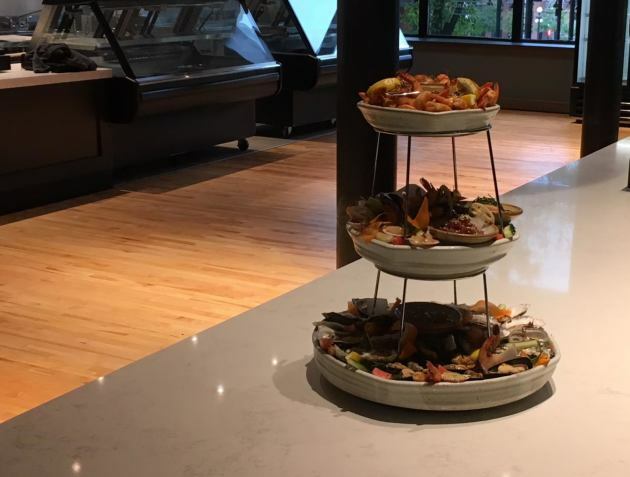 Ahead of its opening on Oct. 10, chef/owner Tim McKee offered a sneak peek inside his one-of-a-kind project in St. Paul’s Lowertown. Market House Collaborative is the umbrella name for a series of interconnected food-focused enterprises: Octo Fishbar, Almanac Fish Market, Peterson Craftsman Meats and the Salty Tart. The first three will open on Oct. 10, and the Salty Tart bakery/cafe will follow in mid-November. All occupy the two-level space that was most recently home to the former Heartland Restaurant & Wine Bar, located across E. 5th St. from the St. Paul Farmers Market. It’s a major endeavor for McKee, and next week’s debut is a fireworks-like finale for what has turned out to be a period of major change for Minnesota’s first James Beard award-winning chef. In October 2015, McKee closed his acclaimed La Belle Vie. In February 2017 he left his executive position at Parasole Restaurant Holdings and joined seafood wholesaler the Fish Guys. Five months ago, he announced his plans for Market House Collaborative. Whew. While staff training was taking place in advance of a weekend of friends-and-family test-runs, McKee hosted a tour of the property, which takes full advantage of the Heartland’s sprawling real estate inside the Market House building. The operation still centers on the 115-year-old building’s timber-framed atrium (“I love this space, it reminds me a little bit of Butler Square,” said McKee, a referring to the downtown Minneapolis landmark where he logged a considerable amount of time during his tenure at the former D’Amico Cucina), but the layout has been tweaked. 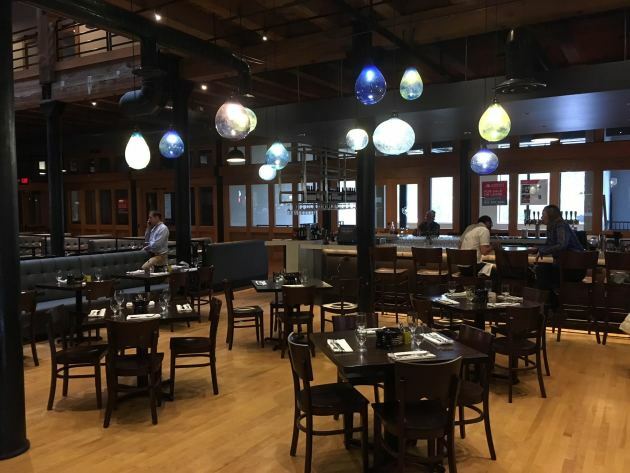 Most notably, what had been Heartland’s formal dining room is now home to the collective’s meat and fish retail counters. 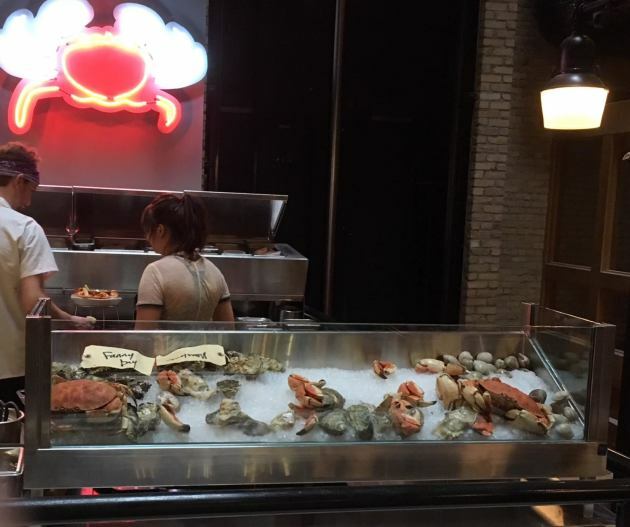 Behind the last chef's table is the raw bar (pictured, above), where Octo Fishbar chefs -- the crew is led by Shane Oporto -- will compose the menu’s crudo items. It's also where the showy seafood towers (see below) will be constructed. Octo Fishbar’s menu: “It focuses on plates,” said McKee. “Not necessarily small plates. But everything is meant to be shared, and passed around. I want people to have a good time, and eat with their hands, and get their hands dirty, and make a mess." 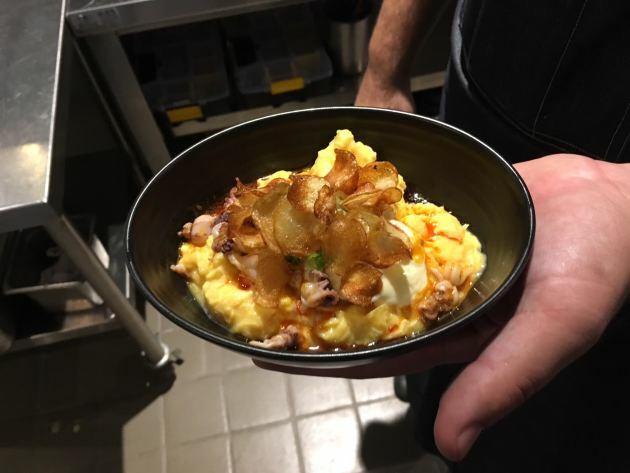 Those “plates” include scrambled eggs with baby squid and chorizo (pictured, above; $12), beer-steamed mussels with guajillo peppers ($10), anchovies with grilled bok choy ($9), bucatini with an octopus Bolognese ($16), salt-and-pepper fried shrimp ($14), charbroiled oysters finished with uni butter and seaweed ($12) and a sunfish shore lunch ($14). Sandwiches will feature a lobster roll ($21), a smoked swordfish bánh mì ($14) and a house-made clam bratwurst finished with whole-grain ink mustard ($9). There will be a handful of whole-fish preparations ($32 to $45), and the kitchen will also highlight the market’s meat counter with a skirt steak ($26) and a pork chop ($20). 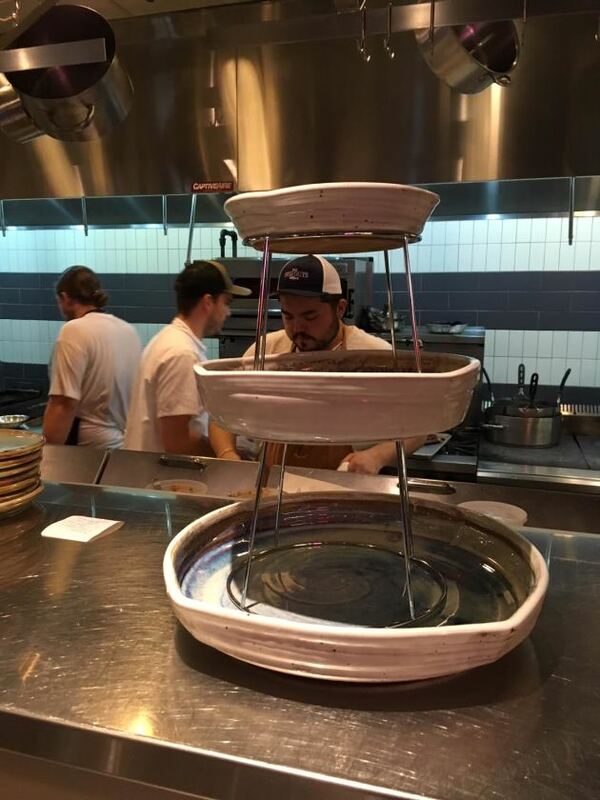 "Our raw features will always have rotating crudos, ceviches, aguachiles and pokes, that sort of thing," said McKee. "We had fun with the seafood towers, I named them for underwater-ey songs that I like. Of course, there’s Prince’s ‘Diamonds and Pearls’ [a two-tiered tower, $65] but I really wanted to build up to the [three-tiered] ‘Leviathan,’ that’s a little Mastodon death metal.” (The accurately christened Leviathan is pictured, above; it includes 18 oysters, 12 clams, 3/4 lb. shrimp, Jonah crab claws, jellyfish salad, 12 pimenton mussels and more, and it's $160). It’s all very casual. How casual? 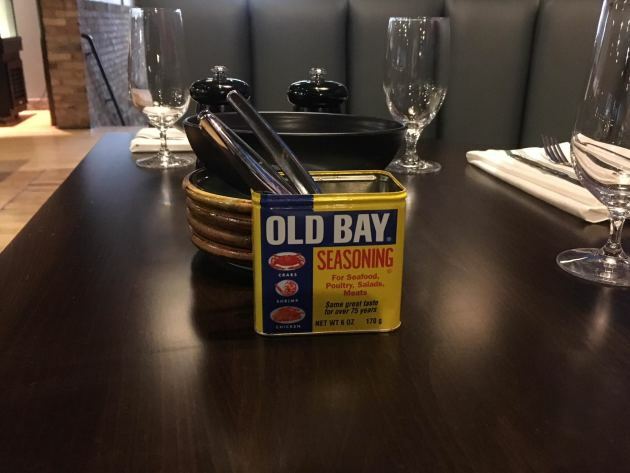 Check out the flatware, stored tableside in repurposed Old Bay containers. Libations: Erik Eastman of Easy & Co. is the amiable talent behind the bar. For his Octo Fishbar cocktail list, inspiration was found in the world’s oceans. For the Arctic, Eastman developed a vodka highball infused with beets, banyuls and a hit of lemon that he calls the Schrute Move. The Pacific is the largest ocean, so Eastman decided that it deserves the largest cocktail: an Old Fashioned made with Japanese whisky and house-made seaweed bitters. 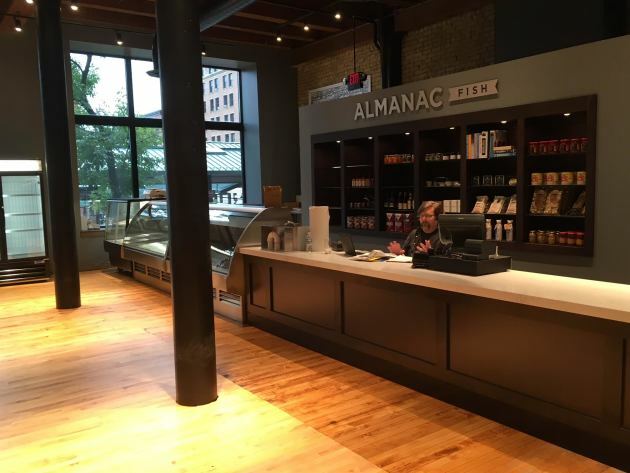 Butcher shop: The counter opposite Almanac will be devoted to Peterson Craftsman Meats (pictured, above). “Andy Peterson has a fourth-generation family farm in Osceola, Wis., and he raises amazing Limousin cattle,” said McKee. “He also raises pigs, and his neighbors raise lamb, and that’ll all be sold here. We’ll also be bringing in poultry from Pat [Ebnet] at Wild Acres in Pequot Lakes, Minn., his chickens and ducks, and maybe pheasants, or turkeys, we’ll keep it rotating. We’ll have meat sticks, and hot dogs, and smoked pork chops, and we’ll make our own sausages." 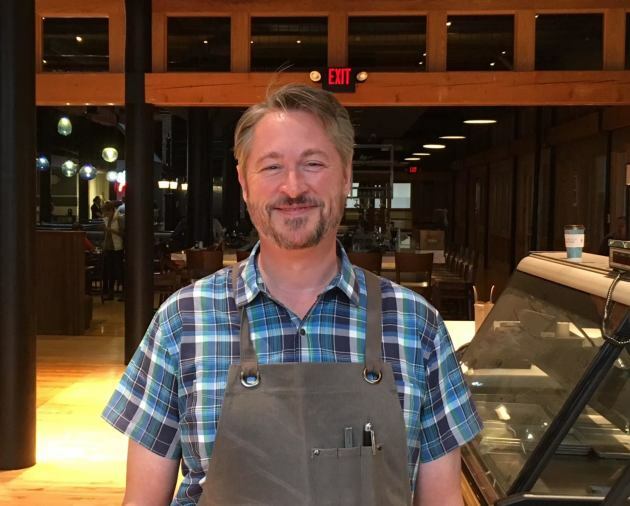 Dan Stepaniak, a Heartland vet, is the shop’s general manager/butcher. At Market House Collaborative, the word “collaborative” isn’t just marketing lip service. “All the meat that we use in the restaurant will come from Peterson,” said McKee. “Our initial menu has strip steak on it, but maybe you see the rib-eye in the case and it looks better to you. You can buy it, and we’ll cook it for you. 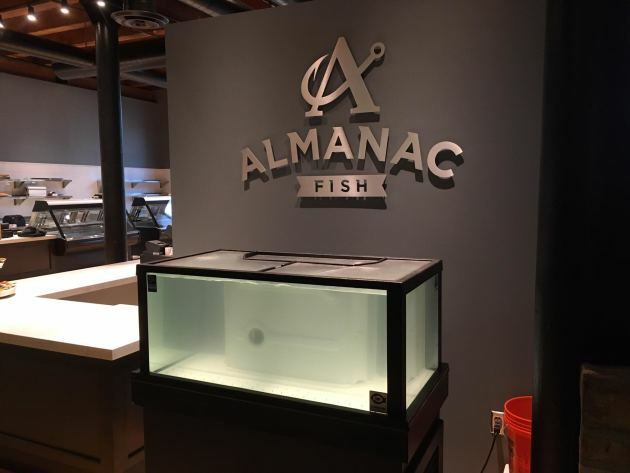 Or if you see a beautiful John Dory in the case at Almanac and you think you’d love to eat it, you’ll be able to buy it and we’ll prepare it here in the restaurant.” Cooking fee: $12 for up to 12 ounces, with $1 for each additional ounce. Coming soon: Michelle Gayer’s Salty Tart bakery/cafe should open in mid-November, occupying the space that was once home to Heartland’s Farm Direct Market (pictured, above). The menu will feature “all the pastries that we do as our normal jam,” said Gayer. “And we’ll also serve breakfast and lunch. Breakfast will be scrambled egg sandwiches and something delicious on the milk bread bun, steel cut oats, frittatas and yogurt parfaits. At lunch, we’ll have grain bowls — quinoa with roasted cauliflower is one example — and two soups. We’ll start with some kind of squash-ey soup, and of course a bouillabaisse because our homies over there [points to Almanac] have the fish thing down. 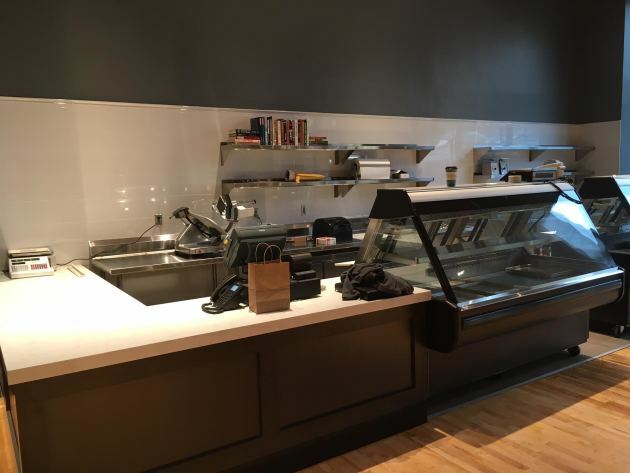 We’ll have a flank steak — from the Peterson folks — and tartines, and panini and tart flambé, and a kale Caesar.” The counter-service setup will also have a full coffee/espresso program, and Gayer will be supplying Octo Fishbar with its desserts (hello, banana cream pie) and breads, including a bun tinted by squid ink. Hours: “The two markets will open at 10 and close at 8,” said McKee. “The restaurant will open at 4, and close at 10. When the Salty Tart opens, I think it will open at 8 and probably close at 7. Next season, when the farmers market opens, the restaurant will open for lunch on Saturday and Sunday, in conjunction with the market. And when next year’s farmers market season ends, we’ll assess the demand, and if we can continue with Saturday and Sunday lunch, we will. I’d love to expand lunch beyond the weekend, because I think this would be a great place to have lunch.” By the way, why "Octo"? 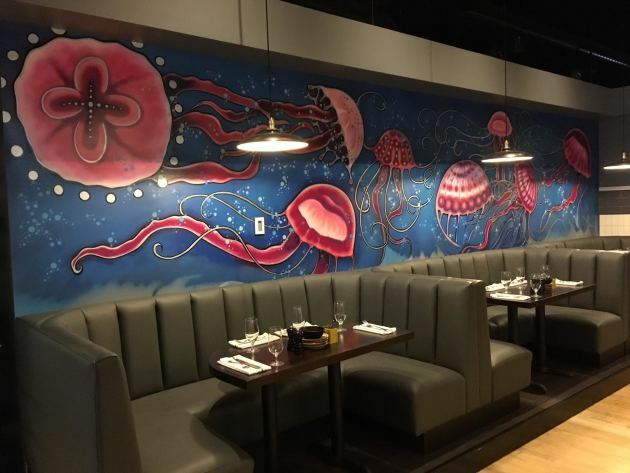 For two reasons: Octopus, of course, but also a nod to the Latin word for eight; it's the eighth restaurant that McKee has built from the ground up. 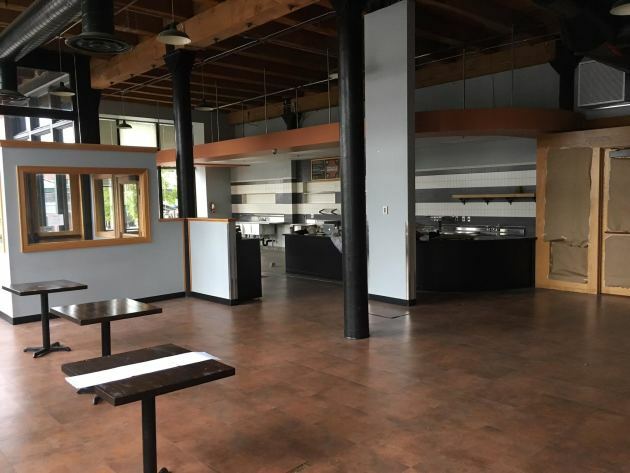 Beer next year: This week, McKee announced that a 651 outpost of Birch’s on the Lake Brewhouse will fill spaces on two floors that were once occupied by Heartland’s private dining rooms. “There’s going to be a bar up here, and through that wall will be a tasting room,” said McKee, pointing out the main-floor space adjacent to the Salty Tart. “Downstairs will be the brewing equipment, as well as a barrel room where they’ll be doing their aging and making their sours. I’m super-excited about that, because sours go so well with seafood.” McKee added that brewery co-owners Brennan Greene and Burt and Ashley Joseph plan to use the lower-level base of the building’s atrium as a beer garden. “It’s going to be the coolest corner in town,” said McKee. Understatement of the year? We’ll find out, soon.